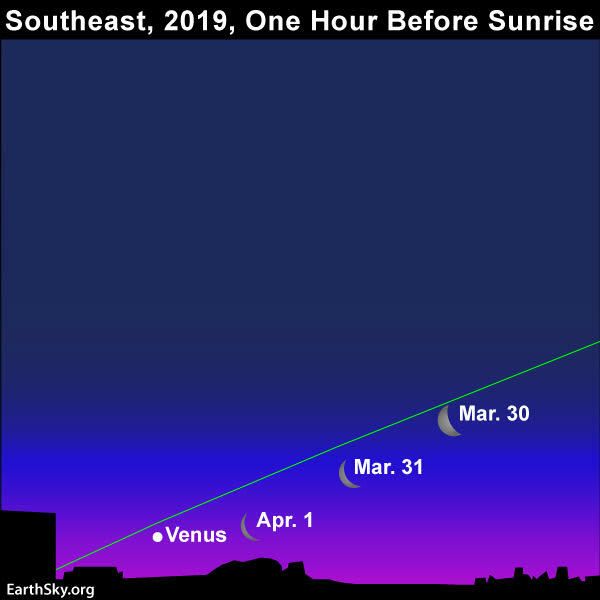 In late March and early April 2019, the waning crescent moon will be sweeping past the brightest planet, Venus. From mid-northern latitudes in the Northern Hemisphere, the pair will be gracing your eastern sky an hour or so before sunrise. From the Southern Hemisphere, the view is much better, with Venus rising a few hours before the sun. Even after all the stars have disappeared in the glow of twilight, the moon and Venus will remain visible, because these two worlds rank as the second-brightest and third-brightest celestial luminaries, respectively, after the sun. 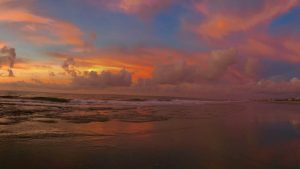 From far northerly latitudes – like Alaska – you may miss the moon and Venus altogether, as these two worlds rise close to the time of sunrise at northerly climes. Day by day, as March wanes and April arrives, the moon will sink a little closer to Venus. Want to know when Venus rises into your sky? Click here for recommended sky almanacs, and remember that the rising/setting times presume a level horizon. Not an early riser? Then look for the red planet Mars and the famous Pleiades cluster – also called the Seven Sisters – in your western sky at nightfall, as shown on the chart below. If you see the tiny dipper-shaped Pleiades, you’ll know that’s Mars near it. 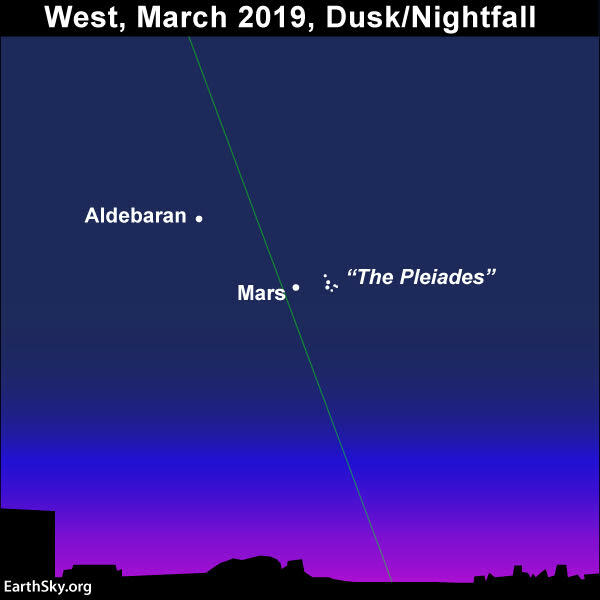 In late March and early April 2019, you’ll find the red planet Mars near the Pleiades star cluster and the red giant star Aldebaran in your western sky after sunset. Notice that the Pleiades looks like a tiny dipper. View larger. 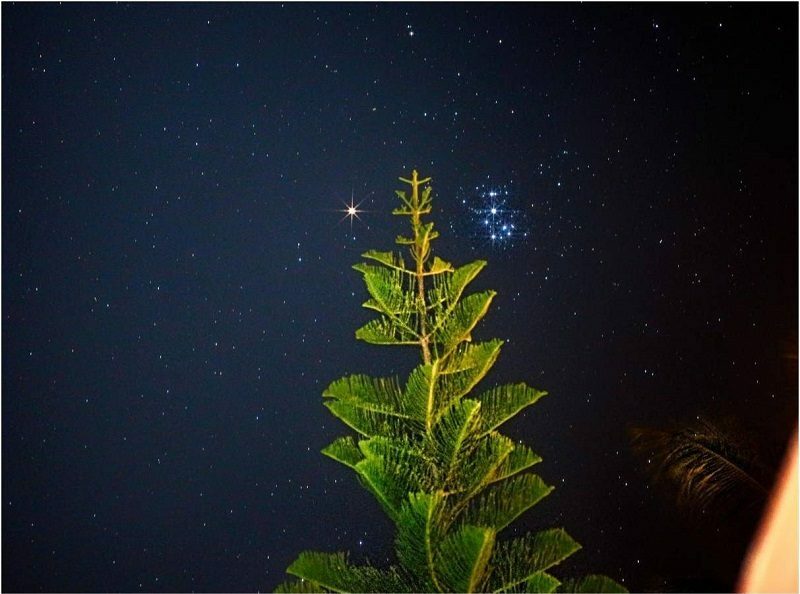 Dr Ski of the Philippines waited all week for this shot of the red planet Mars and the Pleiades star cluster, caught after sunset March 30, 2019. Thank you for the great shot, Dr Ski! All in all, at present, you can catch four of the five bright planets. Mars is the lone evening planet, but Venus isn’t the only morning planet. The king planet Jupiter – the fourth-brightest celestial body, after the sun, moon and Venus – shines mightily at dawn, as well. From the Northern Hemisphere, Jupiter at morning dawn shines in the southern sky, at about the same spot as the noonday winter sun. At dawn from the Southern Hemisphere, Jupiter shines way up high, like the noonday summer sun. Saturn is up before the sun also, but it’s much fainter than either Jupiter or Venus. From either hemisphere, you’ll want to catch Saturn before the dawn light becomes too overpowering. At northerly latitudes, because Venus rises relatively late, ringed Saturn might or might not be visible by the time Venus climbs above your horizon. This chart – which is oriented toward the Northern Hemisphere view – stretches from southeast to southwest, circling one-quarter of the way around the horizon. Southern Hemisphere? Look high in the north to see the planets, along the path of the summer sun. In their order outward from the sun, the five bright planets are Mercury, Venus, (Earth), Mars, Jupiter and Saturn. All of these planets can be seen without an optical aid and have been observed by our ancestors since time immemorial. 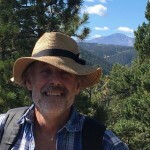 Of the five bright planets, only Mercury can’t be seen – or at least not easily, and likely not from the Northern Hemisphere – in late March and early April. 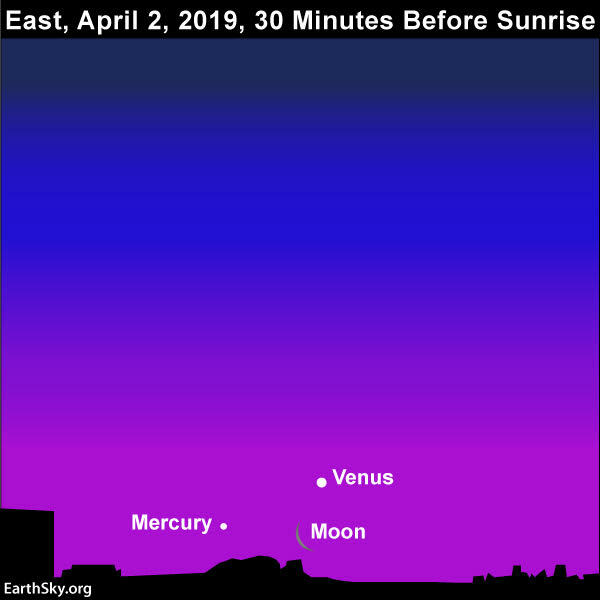 From the Northern Hemisphere, Mercury sits very close to the glare of sunrise in early April 2019. From the Southern Hemisphere, your view of Mercury is better. If you want to see Mercury from either hemisphere, keep your eye on Venus. This brilliant beauty of a planet will help guide your eye to Mercury, the innermost planet, when the two come within four degrees of one another (the width of two fingers at arm’s length) in mid-April 2019. Here’s the exceedingly thin waning moon on April 2, 2019. As you can see, Mercury is nearby. 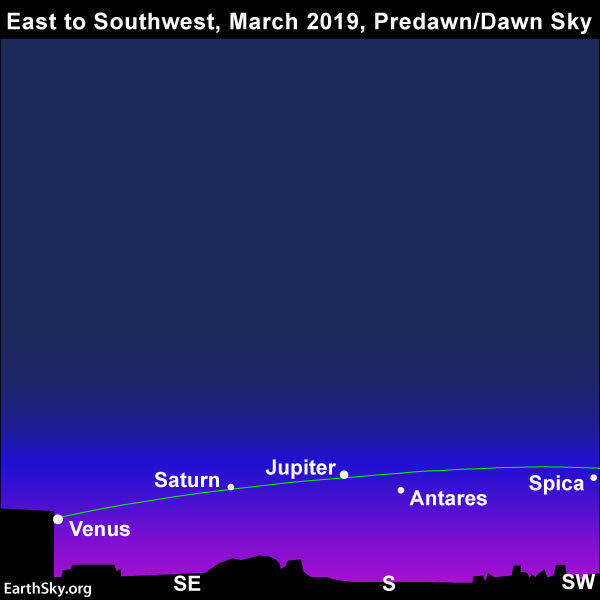 This will be a very tough (perhaps impossible) observation from the Northern Hemisphere, but Southern Hemisphere observers – for whom the moon and planets appear higher above the sunrise – might have a shot at them. Bottom line: In late March and early April, the moon will sweep past Venus before sunup. The red planet Mars is near the Pleiades star cluster at nightfall.